Since long time ago it is known that garlic possesses excellent medicinal properties. It has been used as food and remedy in many cultures over thousands of years. Scientific studies show that it has been used since the time of Egyptian pharaohs and the earliest Chinese dynasties. Garlic and the dietary supplements based on its extracts prevent from many diseases and conditions, including high blood pressure, atherosclerosis, flu, colds, cough, bronchitis, gastrointestinal problems and menstrual pain. Studies show that it can destroy many types of microorganisms: bacteria, viruses, fungi and in some cases even intestinal parasites. Biochemically the most active ingredient in the garlic is an essential oil named allicin which is a natural compound that can lower the high blood pressure, can help the detoxification of the blood, also acts as a natural antibiotic, cures headaches and rejuvenates the body. Improves the Heart Health – It is an excellent superfood for heart health. It helps improve blood circulation, lower cholesterol and prevent heart disease. It helps slow the development of atherosclerosis or hardening of the arteries which increases the risk for a heart attack or stroke. To improve cardiovascular health and prevent heart disease, eat 1 or 2 crushed cloves daily in the morning. You can also take this herb in supplement form after consulting your doctor. A daily dose of 900 mg of standardized garlic powder has been found to be effective. Helps with Toothache – Among many home remedies for toothache, the use of garlic has been passed down for years to treat this issue; the antibiotic compound called allicin is what give garlic this ability. When it is crushed, this compound is released, helping to slow bacterial activity upon application and ingestion. Try applying a crushed garlic clove or garlic powder to the area. It may burn, but the pain from the toothache could vanish within minutes, although it could take hours. Repeat this over a few days, and you all should be well. Cures Ear Aches – It is commonly used for curing ear aches, as it has several antiviral, antifungal and antibiotic properties. Its oil can be made at home by squeezing the juice of its cloves and adding it to olive oil. The mixture should be kept at room temperature for a few days, but shouldn’t be saved indefinitely, if made at home. Treats Fungal Infections – The anti-fungal properties of garlic can also be used to treat fungal skin infection such as athlete’s foot and heat bumps on legs. Mince a few cloves of garlic and cover the affected area with it. Cover this with gauze and let it stay overnight. After washing your feet in the morning, apply garlic oil on the affected area and cover with your sock. Repeat this process for a few days and you will notice the redness and itching subsiding. 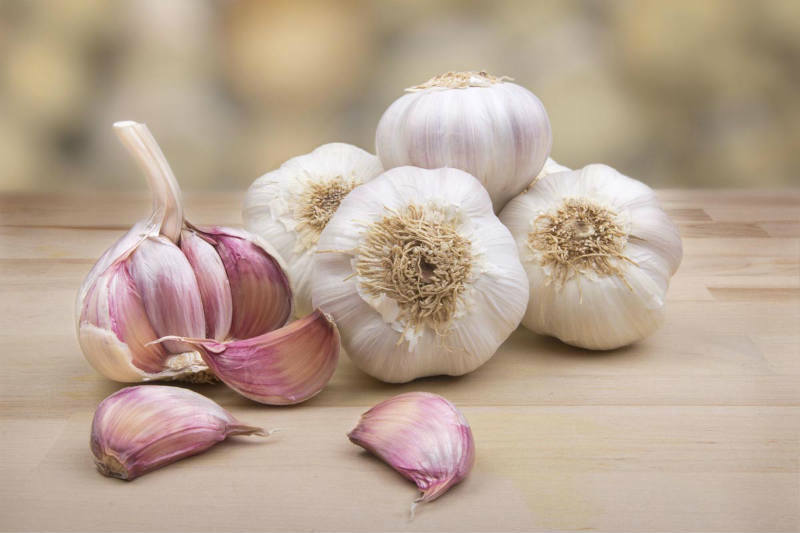 Treats Cough and Cold – Offers antibiotic and antiviral benefits that make antibacterial properties make garlic a wonderful treatment for cough and cold. It may also reduce the severity of upper respiratory infections. Plus, garlic also highly beneficial in treating various respiratory conditions such as asthma and bronchitis. It also promotes expectoration with coughs, making it irreplaceable for those with chronic bronchitis. In addition to eating garlic, supplements can be taken on a regular basis to reduce the frequency of upper respiratory infections. Fights Allergies – It has antiviral and anti-inflammatory properties that help the body fight different types of allergies. It also has been shown to reduce airway inflammation due to allergic rhinitis. It is highly recommended that people with allergies take a daily garlic supplement during the allergy season. Applying minced garlic is a good option for rapid relief from itching due to rashes, bug bites or any other kind of allergy. Controls Hypertension – Studies have shown that also reduces high blood pressure, especially systolic blood pressure. Garlic acts as a vasodilator which helps to widen the blood vessels, making blood flow smoother. People with high blood pressure must eat a few raw garlic cloves daily on an empty stomach. If you do not like the tate of garlic, drink a glass of milk after eating it. You can take garlic supplements, too. Treats Asthma – Boiled cloves are wonderful as an alternative asthma treatment. Each night before going to sleep, a glass of milk with 3 boiled cloves can bring subsequent relief for patients with asthma. The asthma attacks may be brought under control by having crushed cloves with malt vinegar as well. What is the best way to take garlic as an antibiotic? Simply eat fresh garlic and let it do its magic.